However, 10 months after the Department for Work and Pensions (DWP) contacted his doctor without telling him, he died, aged 55. James clearly wasn’t fit for work. The GP had stopped issuing medical certificates when the DWP told him to. It is completely unacceptable that James Harrison was left struggling without support, when he was clearly very ill. It is also unacceptable that James’ GP was given instructions from the state – that caused harm – without James’ knowledge. The certificates – so-called fit notes – demonstrate that the government seems to have some difficulty in recognising that sometimes people get ‘sick’ and require support via the provision they have paid into. David Cameron, however, had other plans for the UK. He said: “We simply have to get to grips with the sicknote culture that means a short spell of sickness absence can far too easily become a gradual slide to a life of long-term benefit dependency. However, the statement isn’t coherent. He infers that people are recovering from a brief period of illness and then refusing to return to work. As we have learned at great human cost over the last few years, this legislation has destroyed the lives of thousands of people who are ill. It was always intended to take away support from those who need it most. That is evident in the Conservatives’ incoherent attempt at a justification narrative, propped up by the right wing media. It never seemed to have crossed Cameron’s mind that 1) people’s medical conditions may worsen, they may have a chronic or degenerative illness. Being chronically ill does not make a person ‘benefit dependent’, it simply makes them ill. 2) The public contributes to the treasury, which is in part a funding mechanism towards social security and other state provisions, via tax and national insurance. This is done on the understanding that the state ensures that citizens can meet their basic survival needs. The Conservatives have clearly stated they have ‘other’ ideas on how our public funds should be spent, which does not include meeting the needs of the public. The state is responsible for handling public funds. It is unacceptable that such contentious neoliberal ideology is being used by the Conservatives to dismantle state provision for those who need it most, while deliberately targeting the poorest citizens with austerity cuts. Meanwhile, millionaires are rewarded with generous tax cuts from the public purse. At the time when the welfare reform act was passed, millonaires were handed a tax cut of £107,000 each per year. This callous and unjustified approach to social administration is destroying people’s lives and has profoundly damaged our democracy and society, while seriously and systematically violating the human rights of the UK’s most marginalised groups. It is very worrying that the clearly dangerous ESA65B form is a standardised response to GPs from the DWP following an assessment where someone has been found fit for work. 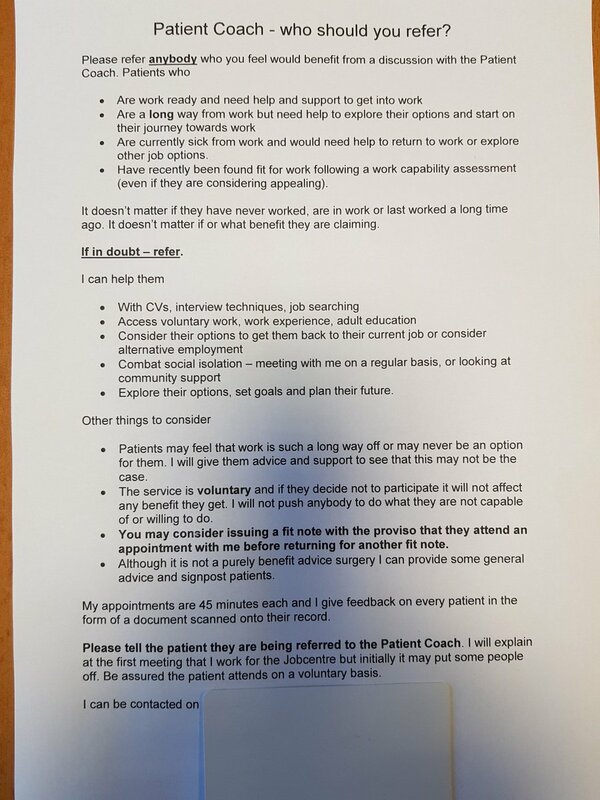 I discussed some of the raised issues further in another article from last year that I posted on Twitter yesterday – GPs told to consider making fit notes conditional on patients having appointment with work coach. I always worry when the government uses the words “encourage”, “help” and “support” in the context of policies and political practices that affect disabled people. They are usually techniques of neutralisation – euphemisms for the actions embedded in punitive and harmful policies. This growing practice of the state intruding in the confidential relationship between a GP and patient undermines trust, it damages the professionalism and clinical expertise of doctors and threatens the safety and wellbeing of patients. It shrinks the safe spaces for citizens to escape the increasingly oppressive practices of the government. It turns GPs into non-neutral agents of the state. Last year, jobcentre staff were forced to withdraw guidance that urged GPs in Leeds to use deceitful tactics to attempt to get people who are ill off social security support and into work. The shocking guidance asked doctors to send patients for a 45-minute session with a “Patient Coach” – without mentioning that the coach actually worked for the the DWP. It was even suggested that GPs withhold sick notes unless patients agreed to attend an appointment with the work coach. The government is forcing people who are ill into either work or into poverty, and both outcomes are absolutely ethically unacceptable, a violation of rights, authoritarian and very dangerous. Increasingly, poverty is being used as a weapon to coerce people into work. However, many jobs are not paying enough for people to meet their living costs, so it is no guarantee that work will alleviate poverty. The government seems to think that citizenship rights ought to be entirely conditional on people being economically useful to the government. If we fail to be so, we are being treated as disposable political commodities. But citizens are not a means to state imposed ends and ideological aims in wealthy so-called first world democracies. And democratic governments don’t generally impose ‘behavioural change’ techniques on citizens, or professionals, for that matter, in order to make them complicit in the abuse and oppression of marginalised groups. The state is increasingly policing and punishing the poorest citizens, leaving them completely isolated and without any reliable support whatsoever. On the DWP’s ESA65B GP’s letter template most recently placed on the government site, titled “Help us support your patient to return to or start work” it says: “We assessed [Title] [First name] [Surname] on and decided that [select] is capable of doing some work, but this might not be the same type of work [select] may have done before. The problem is that people appealing wrongful DWP work capability decisions need to provide sickness certification in order to proceed. GPs are trained and tasked to objectively address health and wellbeing, they should not be co-opted as government ideologues. The decision to change the letter template was made without any scrutiny from or consultation with parliament and the public. It’s worth reading the series of questions by Emma Dent Coad. Prompting accountable and transparent answers from Sarah Newton appears similar to an exercise in pulling teeth. The responses given display the arrogance, contempt and delusions of an authoritarian government. When people become ill, they make an appointment with my GP, and not the secretary of state for work and pensions, and for very good reasons. People need support and treatment, not someone spouting ideologically orchestrated dangerous claptrap about how work is ‘good’ for them. It seems the notion of convalescence and recovery are incompatible with the government’s aim of “getting Britain working”. Catastrophically inaccurate assessments within the DWP are the norm. The government are intentionally reducing access to essential support and services for ill and disabled people, and this ideological attack is causing material hardship, suffering, distress and sometimes, it is killing people. The contentious “fit for work” assessment is forcing severely ill people to look for work and sanctioning them if they’re exhausted, in too much pain to get out of bed, while delays in social security are forcing cancer patients to food banks, and the bedroom tax results in bed-bound ill and disabled people facing horrifying threats of eviction. These are the direct consequence of intentionally punitive government policies, which aim at enforcing ‘personal responsibility’ and ‘behavioural change’ on those citizens with the fewest choices. I was pleased to see Liverpool Walton MP Dan Carden’s letter to Amber Rudd (below) which addresses some of the concerns many of us have raised. He also notes that without a GP’s ‘fit note’, (the Conservative’s Orwellian rebrand of the sick note) it isn’t possible for people challenging Department for Work and Pensions (DWP) decisions to claim Employment and Support Allowance (ESA) in the interim period, until their appeal is heard at Tribunal. Indeed, people who have lodged an appeal against a wrongful decision have been blocked from claiming ESA while awaiting the hearing, due to the misleading letter routinely sent from the DWP to doctors. This prevents untold numbers of low-income claimants from accessing financial support while they wait for months on end to go to tribunal. However, ESA pending appeal is not paid automatically – people usually have to ask for it, and must provide fit notes from their GP, presenting these along with their appeal acknowledgment letter from the Tribunal Courts to their local Job Centre. The Job Centre should report back to the DWP who will arrange for ESA pending appeal to be paid. It simply isn’t appropriate for the DWP to interfere in a GP’s professional and qualified judgement, especially given the high rate of successful ESA appeals, indicating just how poor the decisions issued by the DWP actually are concerning people’s capacity to work. It is wrong for the DWP to discourage GPs from issuing "fit notes". The medical opinion of a patient's own qualified doctor is important evidence for claimants who decide to appeal what are often flawed and unjust Work Capability Assessment decisions. I have a friend who is in dire financial circumstances currently, and who is struggling with depression, Autism and rheumatoid arthritis. Her UC provides £620 per month. Her rent is £500. Her PIP claim has been refused. She is suicidal and dependent on Foodbanks. This vile Govt. say she is fit to work but if she finds a job which then turns out to be too much for her, she is right back at the bottom again. How can this be right? How do these creatures sleep? For those of us in the situation this is further proof that the agenda here is a cull has been declared on those this (and the previous) government deem a drain on resources…the disabled, the chronically sick, the unemployed and the poor. There is no actual goal of improving the lives of claimants by getting them into work…the goal is to reduce the numbers of claimants…by reducing our numbers…one claimant at a time. DWP Department for Work & Persecution. when i do an esa form with a client i strike out the last permission paragraph ‘i give permission to inform my doctor of the wca outcome’ the wca decision is personal data covered by the data protection act and needs your permission to disclose to your gp so dont give it. only the first 3 permissions are legal requirments for claiming the rest are just not strictly needed and can be struck out if you wish and i know some advisers who do, but i just cross out that last one and back it up with a letter to DWP stating ” i expressly forbid and refuse consent for the disclosure of the secratery of states determiniation of my WCA to any third parties under my right to data confidentiality under the data protection act. it is unlawful to disclose my wca without my consent which i do not give. please amend my records in line with this request.’ ‘ never had any problems with sick note stop notices thanks to this. The DWP are now saying that when people claim benefits, consent is not needed because in claiming benefits they agree that the DWP may contact their GP for information related to the claim. 27th report (HL Paper 126). Greta Thunberg’s Message to Davos Elites: Act as If Our House Is on Fire. Because It Is.